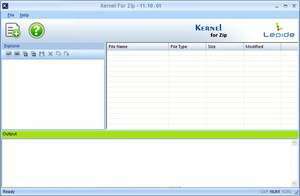 Kernel for ZIP - recover files from corrupted ZIP archives corrupted due to incomplete download, virus attacks or CRC errors. During repairing process a complete scan of the damaged ZIP file is performed to locate and extract the recoverable information. After the complete scanning the files which are recoverable are recovered and copied in the used defined location. For security reasons, you should also check out the Kernel for ZIP download at LO4D.com which includes virus and malware tests. Additional screenshots of this application download may be available, too.